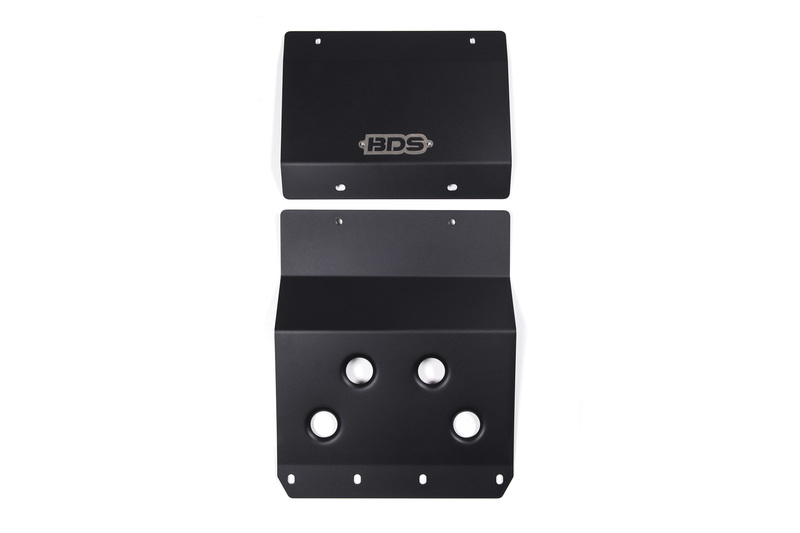 BDS Suspension is now offering a heavy duty skid plate for the late model Chevy and GMC 2500/3500 HD trucks. 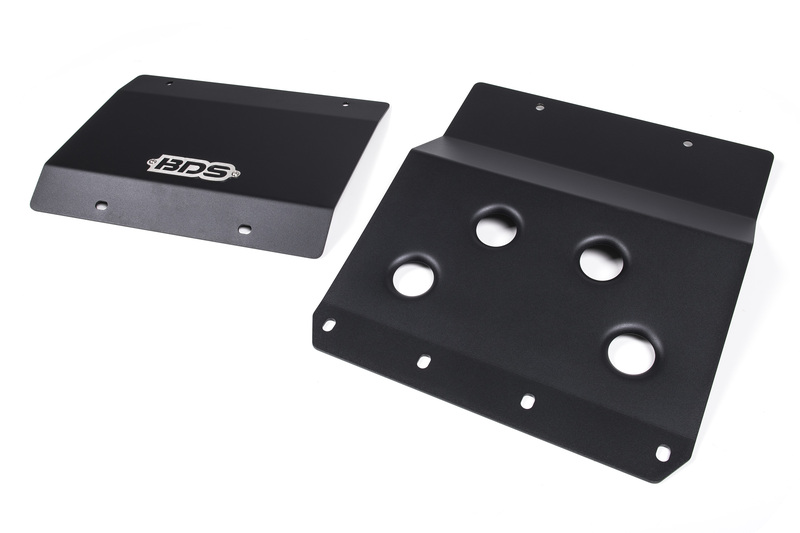 This new skid plate is designed as a bolt-on replacement for the stock skid and plastic splash guard to offer extra protection for the vulnerable steering and front end components. Installation is a breeze as it mounts into original mounting points using factory hardware. 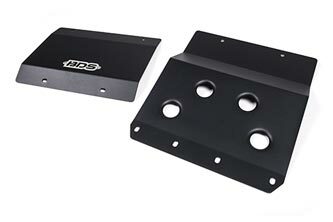 This 2-piece skid plate will work on stock height trucks as well as with leveling kits and the BDS 2-3" coilover conversion system. For more information on this new heavy duty skid plate upgrade see below or head to the BDS website. 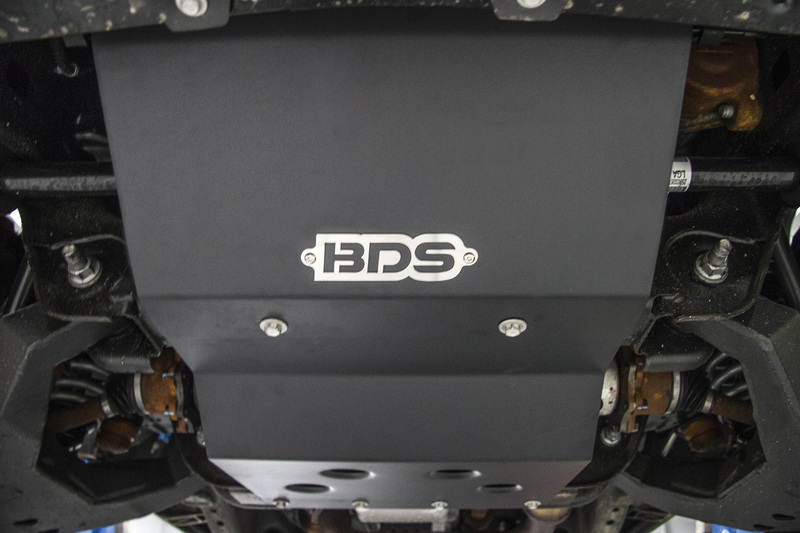 Along with developing full suspension systems designed for increased offroad performance and larger wheels/tires, the engineers at BDS Suspension are constantly working on suspension accessories for popular vehicles. 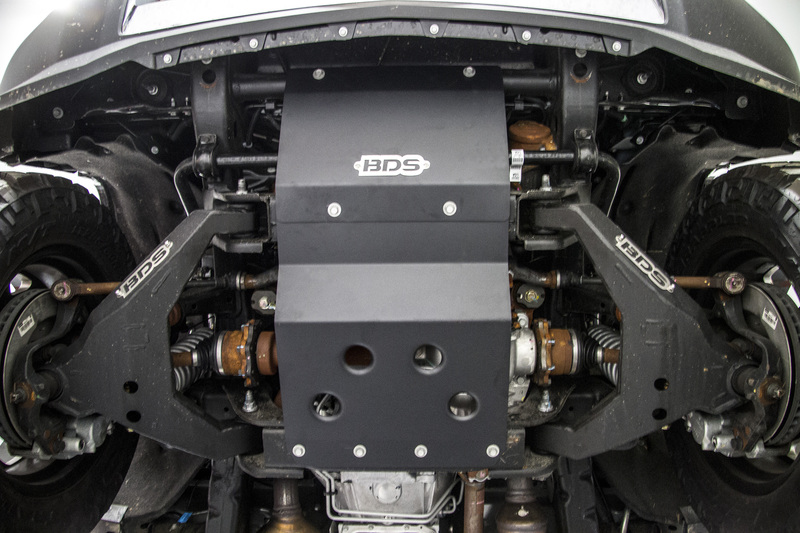 On the heels of the the much anticipated 2-3" Coilover Conversion Systems for the 2011-2016 Chevy and GMC HD trucks, BDS now offers several accessory items that are design to further enhance the truck performance and strength. The newest accessory to hit the market are heavy duty skid plates designed to bolt-on in place of the stock plastic cover and splash guard adding extra protection for the vulnerable front end steering and drivetrain components. 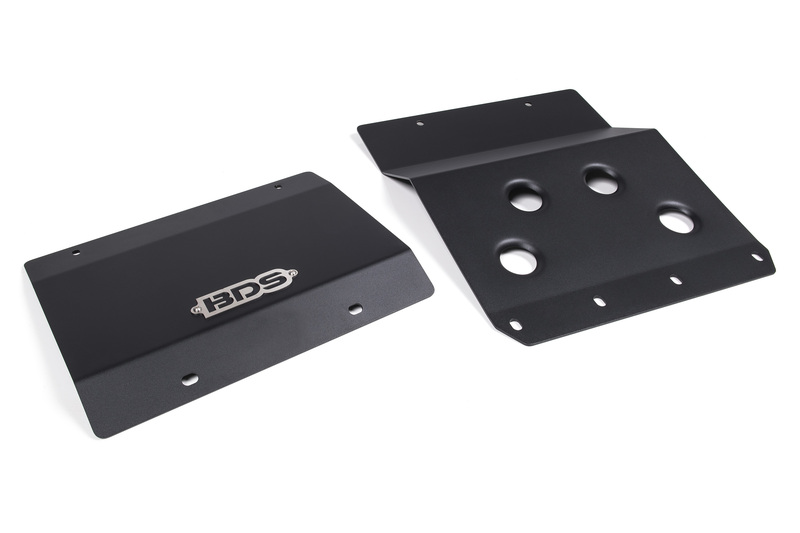 Along with being compatible with the BDS coilover conversion system, these skid plates will work on stock height and leveled trucks. They're built from 10-gauge steel formed to fit the truck's contours, finished off in a durable black powdercoat finish with a stainless steel BDS nameplate riveted in place. Installation is a breeze as the 2-piece skid plate design bolts right in place of the stock plastic skids using the original hardware. The full width design gives plenty of protection from rocks, stumps, and any else you might encounter out on the trail. 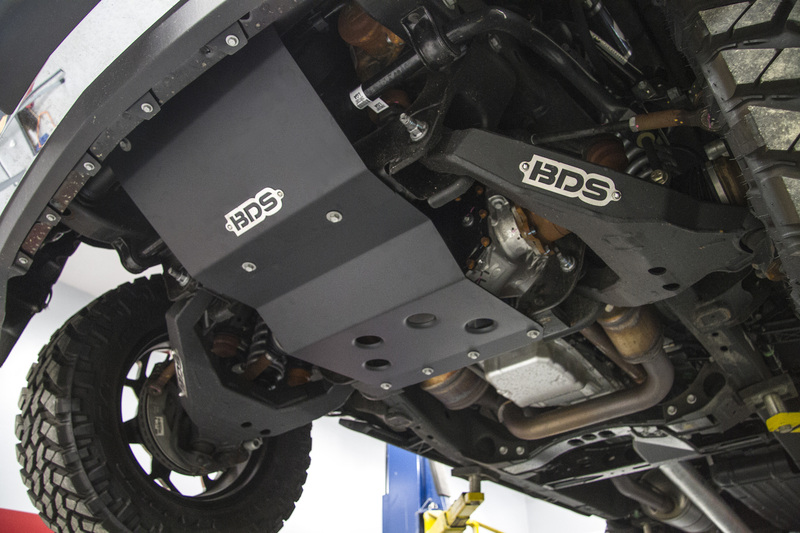 Upgrade your HD’s underbody protection with this heavy duty skid plate upgrade from BDS Suspension. 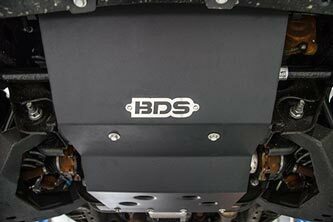 For more on this skid plate and other lift kits and accessories for your GM truck, head to bds-suspension.com or stop by your local BDS distributor. Hey Marty, we actually don’t offer international shipping for manufacturer direct retail orders and don’t currently have any dealers in Australia. Your options to order are to either go through one of our dealers that offers international shipping to Australia or to use a freight forwarder who can provide us with a US ship-to address. Can’t find these skid plates on your website or retailers, what gives? Hey Robert, did you click on the link to view the kit online, we have them on our website at http://bds-suspension.com/product-display?sr=121251 as well as available for purchase through any of our dealers, http://bds-suspension.com/distributor-lookup. To view that part on our website click the link above to bring up the part, there is an “i” next to the listing to view images, description, instructions, etc. Hey Jim, while our skid plate offers extra protection, unfortunately it doesn’t protect all the way back to the trans oil filter. I recently ordered the skid plate for my 2018 Silverado 2500HD. The only issue is that it does not have a support for the radiator hose like the factory plastic plate has. I am concerned this might cause a problem later on. Have you any solutions? Hey Scott, I checked with our tech support team on this topic for clarification. The “support” you are referring to isn’t used to support the radiator hose itself, it is designed to add structural integrity for the flimsy plastic splash guard installed from the factory. The support is not needed with our HD replacement skid plates and won’t cause any issues down the road.